The first version (000964c9) is the one used by Astrid; the second version (0009ccdc) is the one given to you. You can pickpocket the Blade of Woe from Astrid during the quest With Friends Like These... using the Misdirection perk. The blade may also be taken from Astrid using a high level disarm shout. You will then receive a second Blade of Woe at the end of Death Incarnate. You can also pickpocket the Blade of Woe from Astrid after hiding in the Night Mother's coffin, before you leave the sanctuary. The Blade of Woe is the most powerful dagger in the game, but also the slowest. 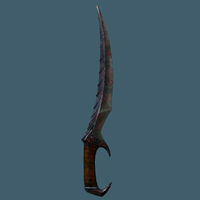 Its burst damage is favorable to stealthy players, as its DPS in normal combat is inferior to other daggers. The Dawnguard add-on adds the dragonbone dagger, which deals 12 base damage and has a slightly lighter weight (6.5), which makes it a much better choice as it isn't reduced to a situational weapon. Unlike any other dagger, The Blade of Woe shares the same speed with swords, which makes it the slowest dagger in game. No materials are required for tempering the Blade of Woe. Whether or not this is a bug or intended by the developers is not known. This issue has been addressed by version 1.0 of the Unofficial Skyrim Patch; based on the keywords that already apply to it, it now requires a steel ingot.